Universities have very good facilities, but would you want to run a conference in one, that is, would it project the right kind of professional image for you? Over the last decade or two, universities have come to see the benefits of acquiring an income stream by making commercial use of their spare capacity. And they do indeed have considerable spare capacity, and also some very high quality facilities. Lecture theatres with tiered seating for 1,000 or more, cutting edge audio-visual technology, buildings dedicated entirely to 'meetings', so that there is almost unlimited scope for 'break-out' discussions, special interest groups, and so on. In addition, universities , well, most of them, now have diverse catering outlets on-campus, modern high-street coffee bars and the like, as well as the more traditional (and nostalgia-laden for some) student union bars and refectories. In fact, provided the facilities are managed on a proper commercial basis by the university authorities involved, then such an institution can be an excellent place for a professional meeting/conference. In the United States, the universities have, for a long time, been places where major conferences are expected to be held. Of course, there has always been a tradition there of universities seeking funds from corporate/commercial sources, and the synergy of quality conferencing facilities and cash-hungry administrations, has lead to this being a thriving marketplace. Even in the States though, most conferences which have taken place in universities have been in relation to technical subjects, in which the university staff and students could be expected to take an interest, and have contributions to make. Of course, universities do offer business courses, and also many campuses offer their facilities 'unbundled' as it were, from the contributions of the academic staff etc. There are many at which you can use just the physical resources, in this country, as in the states. Some universities offer a service only outside of term time, others have sufficient capacity even with a full complement of staff and students present, yet others have dedicated conferencing centres, clients of which are able to use the general facilities as well. 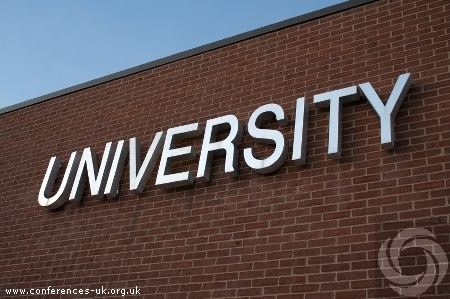 Particular Advantages of university venues: First of all, as has been said, the physical resources, in terms of rooms and equipment, can be second to none. Also, it is quite possible that there are members of the university staff, who could have a distinct and important contribution to make to your conference. Of course many such people will demand fees, but sometimes arrangements can be made with the institution themselves about this. A university is an active place (even out of term) and therefore one can often get away with not arranging anything in particular for 'down-time'. There are free film showings, plays put on by professional companies, 'open seminars' on a large variety of subjects, and of course, bars, music events, and even, for the younger attendees, discos and so on. Often there is not only conferencing, but also exhibition space: large concourses, etc. You and/or your contributors can take advantage of this, to add an extra dimension to the event. It should be noted that concourses, for instance, may only be available out of term time. Particular Disadvantages: These basically boil down to the fact that a university is an academic institution, and not commercial premises. So for instance, sometimes, at some institutions, in term time, the ethos of professional people will not be a comfortable fit with that of the students. It's a mistake for instance to organise an event at a university during rag-week, or fresher's week, or when a particular political issue is at the forefront of university life. Also, some (and I stress, some) university administrations are quite hide-bound: they're not used to dealing with people as customers. Many university conferencing facilities however, are administered by a separate management structure, set up for the specific purpose. Just a note on accommodation, this is usually not a problem, some institutions have dedicated accommodation suites for conference attendees, others have arrangements with local hotels. It is very unlikely that you would be expected to use student accommodation (except sometimes in the summer break). Usually there is not enough of this even for the students. Conclusion: Going back into the academic sphere, albeit very temporarily, can be a positive experience, if managed correctly.